Rai Technology University (RTU) was started with the aim of improving the personal relationship between the students and lecturers to excel in the industrial field. 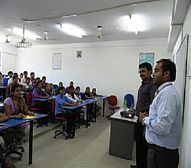 The university provides interactive classes, active learning and improves problem solving skills of the students. The students are provided with industrial exposure in all the semesters in order to help them understand the requirements in the industrial sectors. The university offers courses in fields like technology, science, management and research for improving the skills in the competitive business world. The university conducts innovative programs in all the disciplines including research for the betterment of the weaker sections of the society. The lecturers of the university have high experience in their respective fields and help the students achieve their future goals. The university has counselling and placement cell which has effective interface between academic and industrial activities. The students are provided with seminars, industrial visits, workshops, program plans, pre placement counselling in order to help them improve their employability and leadership qualities. The reputed companies like Tech Mahindra, Bharti Airtel, HDFC Bank, IDBI Bank etc. are some of the top recruiters who hire the students every year. The hostel facility is separate for both men and women with warden in each floor and CCTV camera to ensure privacy and safety. The canteen provides veg and non veg food in South Indian and North Indian style as per the interest of the students. The hostel and canteen fee is affordable by the students who stay far from home and help them improve their academic qualities. The students who are interested in pursuing their PG courses like M.Tech have to clear the GATE exam conducted at national level and for MBA entrance exams like GMAT, MAT, CAT and XAT have to be cleared with good rank. The candidates who are aspiring to study B.Tech courses in the university have to score good rank as per the category cutoff in the JEE Main exam. I never knew about this university’s existence, until I received an SMS from an unknown source. Hostel facilities of this institute are neat and clean with accommodation facility up to 500+ students. The infrastructure of my college is well built, i will not tell excellent but it is comfortable to stay. The syllabus is explained through theoretical and practical way from highly qualified and most experienced faculty members. When I was studying der was no internship opportunities provided. Scholarships and loan facilities are been provided to eth deserving students. I am student of rai university as per my experience university has got innovative teaching method which will benefit the students, great in curricular activities and faculty of the college are highly qualified with PHD. and few are retired faculties from the government universities and central institutes. The hostel are good and hygienic there is separate hostel facilities for both girls and boys which will accommodate up to 500 students there are cctv cameras also available inside the hostel corridors apart from hostel there are many pg's around the college and they provide pure south Indian meals and the hostel fee is 60000 per year. Are you Interested in " Rai Technology University"? Please provide the following details.